Entertainers, from swing bands playing Madchester scene dance tunes to French acrobats, and poets to Portuguese contemporary dancers are set to transform Stoke-on-Trent into one huge festival over the August Bank Holiday weekend. The Big Feast is a festival like no other. It will see more than 80 performances across the city centre and beyond. It is the second year that the Appetite arts programme has organised The Big Feast – and the number and diverse nature of the events has grown each summer. The vast majority of the acts can be enjoyed free of charge while tickets are being sold for a handful of large shows. While The Big Feast is held in around the city centre area, Appetite has arranged a pre-festival Taster Tour with artists appearing in shopping areas, parks and other venues across North Staffordshire. The programme, for both the Big Feast and Taster Tour are outlined below. A full description of performances and artists can be found on the Appetite website: http://www.appetitestoke.co.uk/whatson. The Big Feast brochure is also available to view and download from the website. Monday, August 24 (11am to 4pm). Tuesday, August 25 (11am to 4pm). Wednesday, August 26 (11am to 4pm). Thursday, August 27 (11am to 4pm). Bonus attraction: Traditional Indian dance workshop. Friday, August 28 (10am to 12 noon). The Big Feast – City Centre, Hanley (unless stated). 10am: Poetry Takeaway, Upper Market Square, Hanley. 12 noon: Monster Colours, Stafford Street. 1pm: Pic ‘n Mix, Piccadilly. 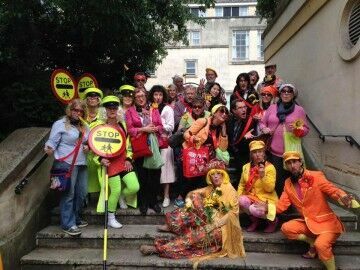 1pm: Funny Peculiar, start at the Blue Clock, Market Square. 1pm: Karvan, Outside Hanley Market. 2.30pm: Full Stop, Bus Station. 3.30pm: Poetry Takeaway, Upper Market Square. 3.30pm: The Lift, mobile show at various locations. 3.30pm: Funny Peculiar, start at the Blue Clock, Market Street. 4pm: Full Stop, Bus Station. 4pm: Mr Wilson’s Second Liners, various locations. 5.30pm: The Lift, various locations. 5.30pm: Full Stop, Bus Station. 7pm: Mr Wilson’s Second Liners, various locations. 8pm: Carousel, Central Forest Park. 12 noon: Bollywood dance workshop, Albion Square. 12.30pm: Weighting, Central Forest Park. 1pm: Funny Peculiar, start at the Blue Clock. 1pm: Covet Me. Care For Me, Bethesda Chapel. 1pm: Oasis Social Club, Bus Station. 1.30pm: Rien N’est Moins Sur, Albion Square. 1.30pm: Poetry Takeaway, Upper Market Square. 2pm: Mr Wilson’s Second Liners, various locations. 2pm: Oasis Social Club, Bus Station. 3.30pm: Funny Peculiar, start at the Blue Clock. 4.30pm: Monster Colours, Stafford Street. 4.45pm: Mr Wilson’s Second Liners, various locations. 5pm: Weighting, Central Forest Park. 6pm: Oasis Social Club, Bus Station. 6.30pm: Mr Wilson’s Second Liners, various locations. 7pm: Soul of Fado, Albion Square. 7pm: Oasis Social Club, Bus Station. 12 noon: Karvan, outside Hanley Market. 12 noon: Poetry Takeaway, Upper Market Square. 12.30pm: Oasis Social Club, Bus Station. 12.30pm: The Lift, various locations. 1pm: Funny Peculiar, start from Blue Clock. 1pm: Covet Me, Care For Me, Bethesda Chapel. 2.30pm: The Lift, various locations. 3pm: Rien N’est Moins Sur, Albion Square. 3.30pm: Funny Peculiar, start from the Blue Clock. 3.30pm: Oasis Social Club, Bus Station. 4.30pm: The Lift, various locations. 6pm: Mr Wilson’s Second Liners, various locations. 6.30pm: Soul of Fado, Albion Square. 6.30pm: Oasis Social Club, Bus Station.